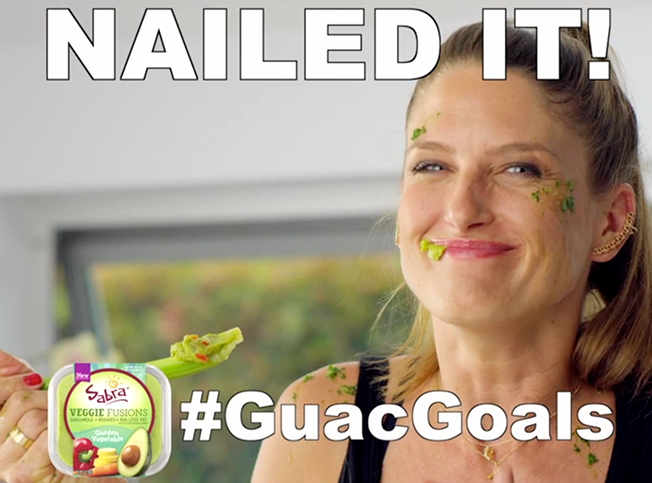 NBCUniversal's new branded content studio, which the company launched in March to develop and produce content for clients that could also exist outside its own platforms, has landed its first major partnership, with Sabra Dipping Co.
Today, the NBCU Content Studio is launching a digital campaign of satirical videos promoting Sabra's Veggie Fusions Guacamole line. The spots, which are inspired by culinary how-to videos, will appear on NBCUniversal's social pages as well as Vox Media's digital properties via the Concert inventory tool (which NBCU and Vox created in April to sell premium advertising across their combined digital properties). The videos, which were created by the NBCU Content Studio, look at the other side of cooking how-to videos, and what happens when things go wrong in the kitchen. The content will run on Bravo, E! and NBC's Today social pages and will utilize NBCU's Social Synch, which helps brands create social media campaigns across the company's portfolio. It will also live on Sabra's brand pages and channels, an example of how the Content Studio's work can exist beyond NBCU. "Working collaboratively with an innovative, new brand partner like Sabra, allowed us to experiment and create a new type of storyline that taps into the cultural food zeitgeist," said Wendy Wildfeuer, svp, The NBCU Content Studio, in a statement. "We leaned into our proprietary insights, storytelling and production expertise, and contextually aligned networks in our portfolio to build a new Sabra content platform." Added Tracy Luckow, marketing director for Sabra Dipping Co., in a statement. "The access to NBCUniversal's storytelling expertise combined with their scale and targeting for distribution is a win-win for us as we share this new product that has already moved more than 1 million units since its release earlier this month." The NBCU Content Studio uses NBCU's creative talent, data, distribution and scale (including its partners BuzzFeed, Vox and AOL) to create its campaigns. While the company has had great success over the past decade creating branded content campaigns for its advertising partners, it realized it could be generating even more business in that space. "People think, 'Oh, I know you do that, but only when I buy media from you and it's part of a media deal,'" John Harrobin, chief marketing officer, NBCU advertising sales, said in March. "But we have opportunity well beyond that."